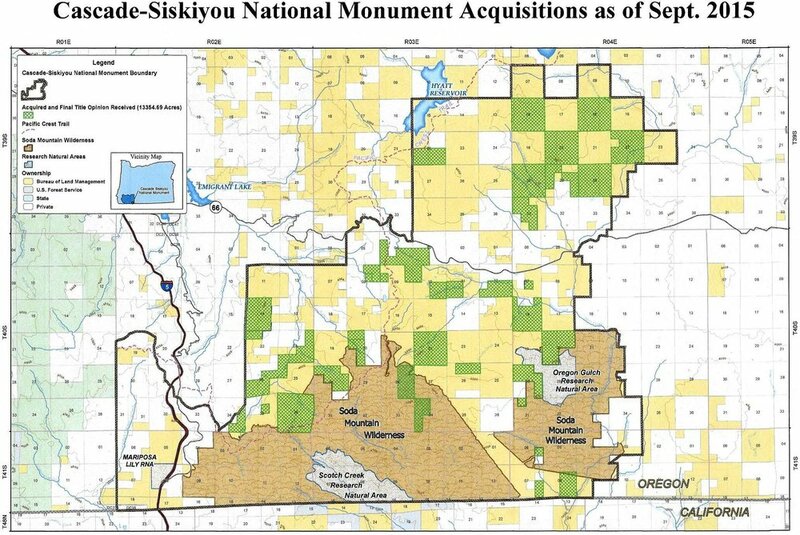 Have you ever studied a map of Cascade-Siskiyou National Monument and noticed all the private land within the monument? This checkerboard of public land and private land makes management of this eco-rich area very complicated. And, by the end of this month a major change could make managing the checkerboard even more challenging. Early in our monument’s history, the Bureau of Land Management (BLM) made it a priority to establish connectivity corridors by purchasing lands to fill in this checkerboard. The Land and Water Conservation Fund (LWCF) has been integral in helping fund acquisition of private land as it comes up for sale within the monument. The LWCF is a federal program funded from royalties paid by energy companies drilling for oil and gas on the Outer Continental Shelf. That money is then used for land conservation and park development. LWCF was established in 1964, and since then the fund has conserved more than seven-million acres across 40,000+ project sites. Most people don’t realize the impact this fund has had on our communities, at no taxpayer expense. The list of landscapes that are in the public domain because of this fund goes on and on, including National Parks, national wildlife refuges, national forests, rivers, lakes, trails, and community parks in every single state. For Cascade-Siskiyou National Monument the fund is vital to monument connectivity and safeguarding biodiversity. “To date, we have added a total of 12,607 acres to federal ownership in the CSNM through the LWCF,” informs Joel Brumm, BLM Assistant Monument Manager for Cascade-Siskiyou National Monument. So, with all this in mind, we should all be very concerned about what is about to happen: the LWCF authorization is set to expire at the end of September. If Congress doesn’t act, this fund that is so vital to our communities in establishing recreation opportunities, clean water, and conserving landscapes for future generations will disappear. Contact your House and Senate representatives today to tell them just how much you appreciate the landscapes and parks this fund has helped acquire, conserve, and protect, and urge them to not let the LWCF expire. This 2015 map shows land acquired (in green) through LWCF within the monument. Since then a 314-acre Mountcrest parcel located in the extreme NW portion of the CSNM on the West side of I-5 and an important 5-acre parcel along Keene Creek that is critical habitat for the federally-threatened Oregon Spotted Frog have been added. Friends of Cascade-Siskiyou National Monument.